Welcome to Xander Wang’s homepage! 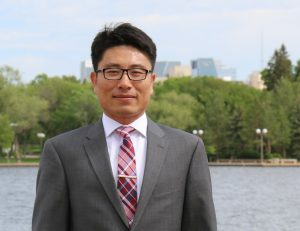 Dr. Xander Wang is a tenure-track Assistant Professor in the new School of Climate Change and Adaptation at the University of Prince Edward Island (UPEI). Before joining UPEI, Dr. Wang was a tenure-track Assistant Professor in the School of Geosciences at the University of Louisiana at Lafayette. Dr. Wang’s research is mainly focused on regional climate modeling (with PRECIS, WRF, and RegCM), climate downscaling, hydrological modeling and flooding risk analysis, energy systems modeling under climate change, climate change impact assessment and adaptation studies, GIS, spatial modeling and analysis, big data analysis and visualization. He is the developer and maintainer of Climate Change Data Portal (CCDP, available at http://ccdp.network) which is aimed to provide free and easy access to the latest climate data to help improve our understanding of future climate change at regional and local scales. The current version of CCDP contains four separate sub portals: Canada CCDP (http://canadaccdp.ca), China CCDP (http://chinaccdp.org), Ontario CCDP (http://ontarioccdp.ca), and Prairie CCDP (http://prairieccdp.ca). Since its initial launch in January 2014, CCDP has received more than 40,000 downloading requests from over 500 registered users around the world. In addition, Ontario CCDP has been recommended as the top 1 source for climate data in Ontario by Ontario Centre for Climate Impacts and Adaptation Resources (see http://www.climateontario.ca/CData.php). Dr. Wang is also the developer and maintainer of rSCA which is an R open-source package for multivariate modeling and clustering (available at https://cran.r-project.org/package=rSCA). According to the latest statistics from RDocumentation (https://www.rdocumentation.org/packages/rSCA/versions/2.1), rSCA has received over 100 monthly direct downloads. Dr. Wang has a multidisciplinary background in climate science, environmental science and engineering, GIS and remote sensing, water resources, computer science, statistics, and data science. He is constantly looking for passionate graduate students and research scholars to work on the climate change challenges that we are facing now and will continue to face in the future. If you are interested, please feel free to contact Dr. Wang with a brief introduction of your research interest.